Holidays to Caleta de Fuste are popular all year round, the resort lies on the east coast of the island, just a convenient 15 minute taxi ride from Fuerteventura airport. The wide horseshoe shaped beach here is a main feature of holidays in Caleta de Fuste with its gently shelving golden sands making it ideal for children and family holidays. Fuerteventura is the least developed of the four main Canary islands and other than the island's natural beauty much of its appeal during the day is focused on the beaches. Caleta de Fuste is a superb choice for a relaxing beach holiday in comfortable surroundings. 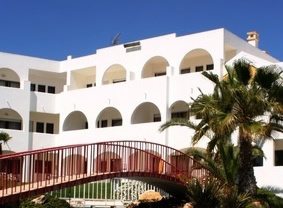 The resort is flat and therefore suitable for those with mobility problems unlike other popular holiday spots in other canary islands. The best golf course is situated here and is a major attraction for golfers all year round. Couples and families will enjoy the resort and beach-life in Caleta with lots of water sports on offer and it is a great place to learn to windsurf. The beach is overlooked by a palm fringed promenade running through the resort, on the beach you will find beautiful golden sands and calm seas. The marina is nearby, so if you prefer to take a boat trip or just look at the yachts sitting in the marina it is not too far, also from the marina it is possible to take submarine trips, so you can explore beneath the sea around Costa Caleta. The marina is also an ideal base to explore the rest of the island so why not hire a car or take one of the local buses to see some of the other beaches and resorts. Boat trips leave the Costa Caleta harbour on most days and on a good day you could be lucky enough to see some dolphins, whales and turtles. For shopping and souvenir hunting whilst at Costa Caleta, you should go to the nearby Pueblo Majorero, a small attractive village near the beach. There is also a shopping centre close to the Sheraton and Elba Sara hotels which includes a supermarket and several shops and fashion boutiques. If you enjoy dining out Costa Caleta offers some good restaurants with a choice of Greek, English, Chinese, Indian and Mexican food so you are guaranteed to find something to suit all tastes. As far as night life goes there are a lot of different bars and pubs which have music entertainment or satelite TV, yet despite the number of bars dotted around the resort, holidays in Caleta de Fuste are fairly quiet and party goers would be better suited elsewhere. Travel Empire's favourite spots in Caleta de Fuste; The island diner for lunch (on the beach in front of the Sheraton hotel) and the Fado Rock restaurant.